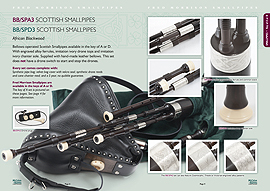 McCallum Bagpipes doesn’t just cater for pipers. As approved agents for Andante, Pearl & Premier drum companies, we provide an unrivalled selection of instruments and accessories under one roof. We are able to supply individual and pipe band customers with best selling bass, tenor and snare drums in all finishes, as well as a broad selection of drum sticks, beaters, carriers and drum heads. Our vast catalogue of drum spares will help to keep your instruments well maintained and sounding as good as the day they were purchased. Our resident percussion expert Stevie Kilbride has a wealth of pipe band drumming experience behind him and he is here to help you make the right choice. McCallum Bagpipes is proud to be the main distributor for the Eric Ward Percussion brand of pipe band snare drumming products. Eric Ward Percussion has channelled Eric’s vast experience as a championship winning leading drummer and soloist into the research, design and development of top end products that pipe band snare drummers of all levels of ability and experience can enjoy playing. The range includes the highly popular Eric Ward 1 snare drum stick that has been a long time favourite in the pipe band scene. The brand new Eric Ward 2 snare drum stick has been recently developed and is now available from McCallum Bagpipes. Eric has also developed the new Eric Ward snare drum practice pad, which has a standard hard pad for responsive and defined practice on one side and a soft rubber pad on the other for quieter practice, essentially combining the qualities of two separate pads. 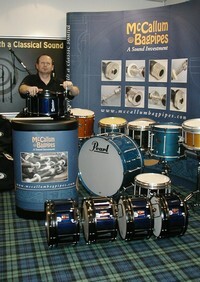 Please contact us for further information on our range of drum supplies.